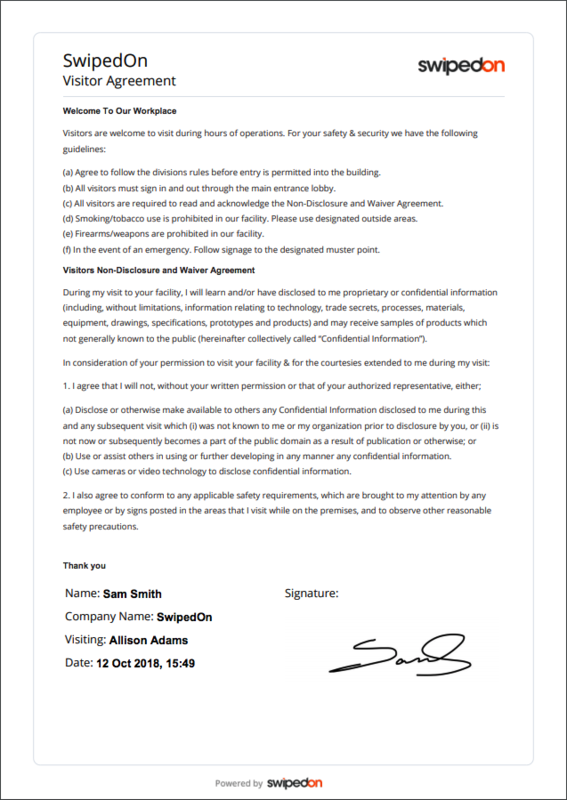 The visitor agreement feature is an easy way for you to have your guests read, sign and accept your health and safety notices, non-disclosure agreements or welcome messages. It's also the place to show your data policy disclosures for compliance with GDPR. The visitor agreement type can be PDF or Plain Text. Ensure that PDF is selected from the 'Visitor Agreement Type' drop-down menu. Then click on 'Upload PDF'. Choose the PDF file and 'Upload'. PDF visitor agreements should be one file, of no more than five pages long. The maximum file size should not exceed 10 MB. PDF files should be A4. PDF files should be saved in portrait prior to upload. Landscape files will not load. Use the Preview button to see your agreement in the way it will appear to your visitors. Plain text is the default setting for visitor agreements. Simply edit text within the editor. You can add your logo directly to the agreement. On the visitor agreement page, you'll see an 'Upload Logo' button on the right-hand side. Supported file types: .png or .jpg file. How to download the visitor agreement? Navigate to the 'Timeline' view on your visitors tab. Click on a visitor name and then click on the 'Download Agreement' button. To see all agreement of a single visitor, simply use the search bar and search their name. This will return all visit results. Can my visitors get a copy of their signed visitor agreement? Yes, they can. During registration visitors can choose to have the agreement emailed to them simply by entering their email. 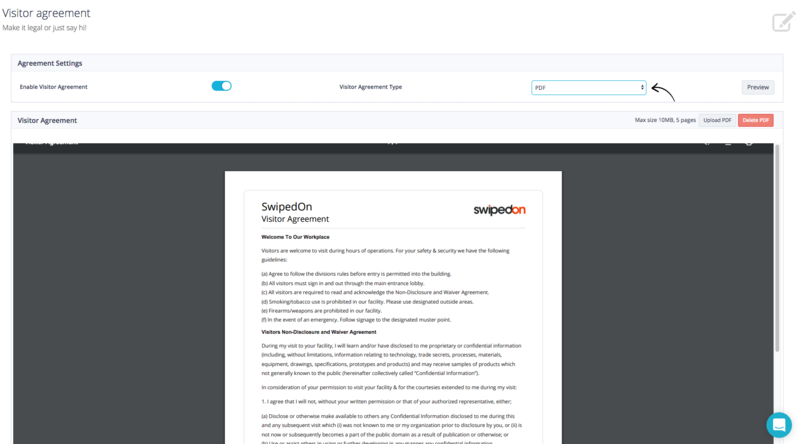 *SwipedOn does not collect nor use your visitors' email addresses entered for this purpose.